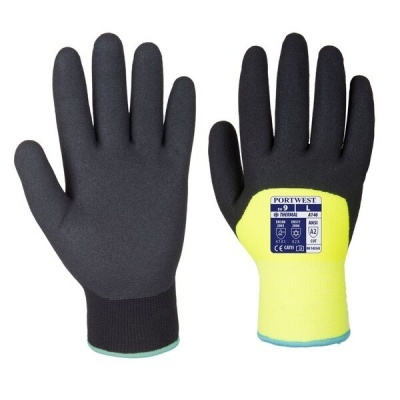 Combining outstanding grip, mechanical resistance and comfort, the Portwest Nitrile Dipped Winter Yellow Gloves A146YE can safely be used indoors and outdoors, in both clean and dirty environments. While their exceptional contact resistance of up to 200°C makes them especially suitable for use in harsh wintry conditions, you can use them with any general handling application that involves moderate mechanical risks. The Portwest Yellow Gloves A146YE are available in four sizes, one of which should suit the hands of most users. Please measure the circumference of your hand around the knuckles (excluding the thumb) with your hand open and your fingers together, and the length of your hand from the tip of your middle finger to your wrist.